»The Latest»My Contribution to National Empty Chair Day…. 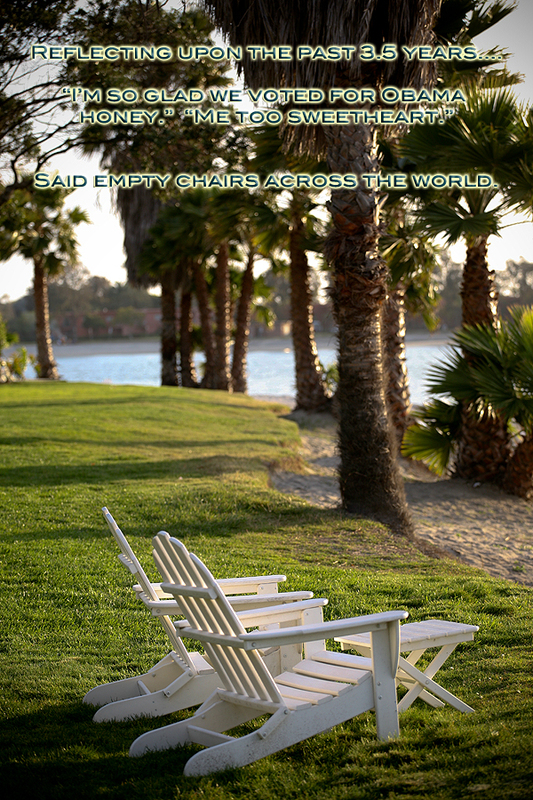 My Contribution to National Empty Chair Day…. I took this photo in San Diego back in April of 2010. We are from Southern California (West Orange County), so San Diego was the most economical & closest location we could (barely) afford. That is the last vacation we have taken, and even then it was a HUGE sacrifice. How many vacations has Barack & Michelle taken and how many of our tax dollars were spent on their extravagant demands? Their jet setting/country hopping in the wake of the most serious economic decline since the Great Depression, while people struggle to find work, feed & clothe their children, keep their homes, put food on the table, pay their utility bills….it’s very sad that there is no compassion, and no example from our president that he feels our pain. Instead they flaunt their lifestyle in our faces as we suffer. How very disrespectful & arrogant! It’s time to cut them off and send THEM back to Chicago. Romney-Ryan 2012!! !